This was a claim made on a BBC 4 documentary available on youtube, 'Viking Sagas'. Worth watching. There was a chap with the charming name of Skullsplitter. 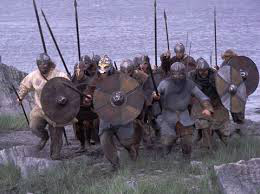 I am researching the period for a humerous novella, about some 21st Century geriatrics, who decide to become Vikings.